Multivariate adaptive regression spline fitting or MARS (Friedman 1991) provides a useful methodology for flexible adaptive regression with many predictors. The MARS methodology produces an estimate of the mean response that is a linear combination of adaptively chosen basis functions. Recently, a Bayesian version of MARS has been proposed (Denison, Mallick and Smith 1998a, Holmes and Denison, 2002) combining the MARS methodology with the benefits of Bayesian methods for accounting for model uncertainty to achieve improvements in predictive performance. In implementation of the Bayesian MARS approach, Markov chain Monte Carlo methods are used for computations, in which at each iteration of the algorithm it is proposed to change the current model by either (a) Adding a basis function (birth step) (b) Deleting a basis function (death step) or (c) Altering an existing basis function (change step). In the algorithm of Denison, Mallick and Smith (1998a), when a birth step is proposed, the type of basis function is determined by simulation from the prior. This works well in problems with a small number of predictors, is simple to program, and leads to a simple form for Metropolis-Hastings acceptance probabilities. However, in problems with very large numbers of predictors where many of the predictors are useless it may be difficult to find interesting interactions with such an approach. In the original MARS algorithm of Friedman (1991) a heuristic is used of building up higher order interactions from lower order ones, which greatly reduces the complexity of the search for good basis functions to add to the model. While we do not exactly follow the intuition of the original MARS algorithm in this paper, we nevertheless suggest a similar idea in which the Metropolis-Hastings proposals of Denison, Mallick and Smith (1998a) are altered to allow dependence on the current model. Our modification allows more rapid identification and exploration of important interactions, especially in problems with very large numbers of predictor variables and many useless predictors. 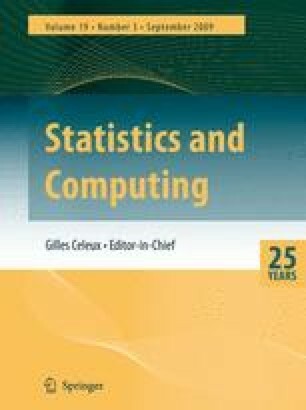 Performance of the algorithms is compared in simulation studies.